Bee expert May Berenbaum knows that many people have an uneasy feeling about bees because they sting. MAY BERENBAUM: "But on the other hand, people all over the world have developed a dependency on the honey bee because it is really the world's premier managed pollinator. And here in the US, for example, over 90 crops depend on honeybees for pollination services." Farmers depend on bees to help them grow crops. But many bees have died in recently because of what scientists call colony collapse disorder. Berenbaum says there are many reasons for this. One is the long-distance transport of bees to pollinate crops. This has helped spread bee diseases. Another reason is the build-up of insect-killing pesticides in bee colonies. Researchers like Berenbaum are studying the problem. Yet she says all of us can help. 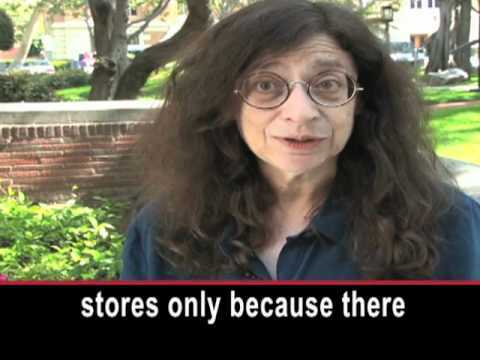 MAY BERENBAUM: "You can buy local honey. Local honey is available at stores only because there is a local beekeeper who went to the trouble of harvesting it. So the more beekeepers there are, the more honey there is. We've, over the last 25 years, seen an alarming decline in the number of beekeepers. It's starting ... the interest is resurging, which is the best news for America's bees ... actually more beekeepers!" She says people can help by planting flowers and learning to live with weeds, some of these provide food for bees. Berenbaum was in Los Angeles to receive the Tyler Prize for Environmental Achievement. She says the prize of $200,000 will help a project involving "citizen-scientists." MAY BERENBAUM: "We have one project called bee-spotter, which is now restricted to Illinois, where we ask people to go out with a digital camera, even a cellphone, and photograph either bumblebees or honey bees." She is pleased with the project. MAY BERENBAUM: "A citizen-scientist outside Peoria actually sent in a photograph of a species of bumblebee, the rusty patched bumblebee, bombus affinis, that was thought to have gone extinct in that area, and was recovered by a private citizen with a digital camera." Berenbaum says we should not forget that bees are also important for the honey they produce. So in addition to pollinating crops, the honey bee makes our lives a little sweeter. I'm Christopher Cruise.